I stood in the cathedral listening to the guide rambling on in that strange half-light which exists in such places. My daughter stood next to me. My heart hammered as the psychologists predict it will do on such occasions. Outside the cathedral was the gaggle of a feria: the courts were not in session, slaves were not obliged to work, so to speak. The Punch and Judy show was a attracting hordes, and the craft show had tented stalls running beside the cathedral with an Aladdin’s cave of creations to choose from. My daughter is 11. I took a deep breath. Let go, I told my heart sternly. “Do you have your phone?” She nodded vigorously. And she disappeared down that towering ancient aisle, a tall young foal receding in amongst all the other vertical lines of the place. Somehow, I couldn’t concentrate on the guide’s words any more. She was full of the fascinating, but I felt suddenly shiftless. Reluctantly – such a tour is like a pretty string of pearls to me- I began to scan for a good time to melt away from the group. I scanned the vast crowd of celebrating souls and she slipped into view holding a package and a beam from ear to ear. She had seen me eyeing up the hares by Devon artist John Hilder as we walked by that stall earlier. Beautiful rangy, bony hares, long-eared, with the hare’s combination of calm and pent readiness, it was one of a series of pottery figures sat in amongst the tents. But we don’t buy anything but necessities these days. I had looked longingly and taken a business card. My daughter had gone back. She had money left from a recent trip away, and she had bought a hare. And now, as I write he is sitting on my reference books staring with a level stare as I try unsuccessfully to wrap him in words. The hare is an ancient soul running fleet as the wind through our legends and tales. He sticks his nose round the lintel of this cyberplace quite regularly, because he runs deep through the psyche of the Englishman. Reaching speeds of up to 45 miles per hour, changing direction in an instant or diving into a stream at the sight of a predator, they are not tied to a home range. 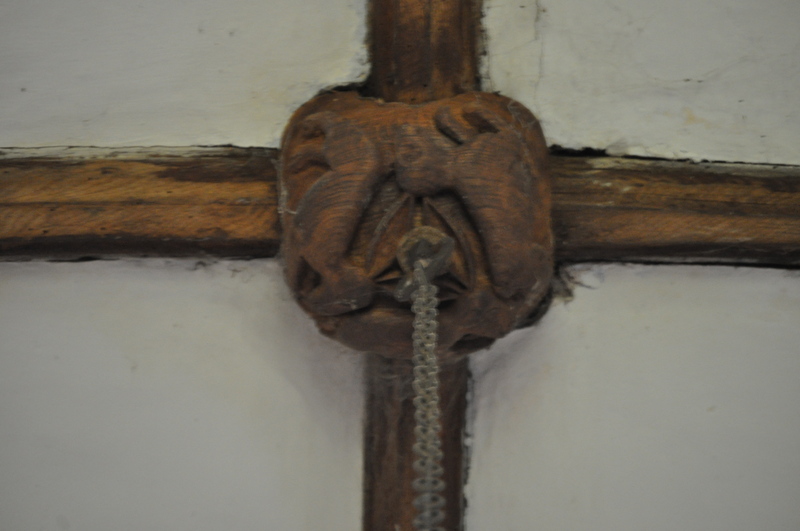 I have written before about the strange symbol of three hares which appears in so many places in the west of England. There it was again at the Cornish house of Cotehele. Three hares with interlocked ears in a tight circle. A 2004 study – the Three Hares Project -traced this strange symbol, which has threefold rotational symmetry and interlocks in the manner of a puzzle. It seems that it appears along the old spice routes: first in seventh century cave temples in China, in Mongol metal work and on a thirteenth century Iranian coin, on a reliquary from Souther Russia: and so across Europe to England. Always expressing not just peace and tranquility, but also the unbearable lightness of being. The paradox of being at great peace, and yet poised for action. So: our hare is quite the traveller. It is not attached to one place. It has bewitched a swathe of the world. Posted in Quirks of History, Shrewsday MansionsTagged ceramic hare, Devon, Exeter, hare, John Hilder, spice route, three haresBookmark the permalink. Look forward to hearing more Kate. This is a wonderful piece of writing. Informative, touching, and a pleasure to read. You have made me feel guilty at all the dozens of hare-endously corny ‘hare’ jokes I have specialised in. They seem a bit of a hare-esy, somehow. What would we do without your hare-udite take on each post, Col? Heehee! I have also added, in post above, a hare-elpful observationt! I was struck not by the tale of the Hare, but, by Young Maddie and her simple kindness. Not many children would be so sensitive to see a longing by their Mother and act upon it. What a sweet girl. A gift twice given, first of the kindness of such a dear daughter, second the gift of the hare. What a sweet girl growing into young woman Maddie is, Kate. I suddenly feel like rereading Watership Down. It’s the one book Mad won’t read, Penny, thought she loves all things bunny. Too sad! Now Hares will mean love and thoughtfulness, whatever else they might mean. Looks like someone gave him salad spoons for ears ~! Aw, Maddie. What an awesome person she is. Took me completely by surprise, Andra. It’s awful when they start to grow up..terrifying to say the least but also beautiful..what a lovely gift! Maddie is amazing! She is. But then, I would say that 😀 I’m her mother. And he looks completely at home sitting on your reference book… as if he owns it, owns all wisdom, all knowledge. Your hare has such an inquisitive look to him, beautiful. And so sweet of your daughter 🙂 great post! Thanks, Lexy! It was lovely of her. 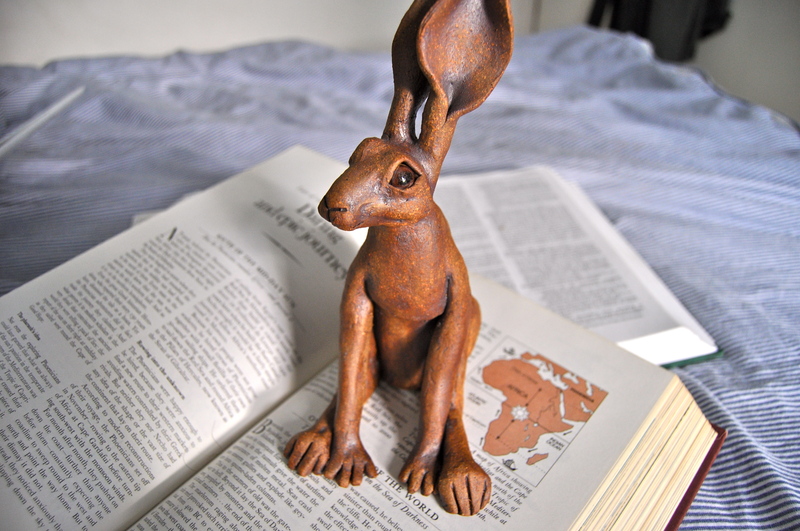 The hare will always be a treasured possession. What a thoughtful kid! Love the story, love the hare. Great ears! The ears are world class, aren’t they? That hare is perfect! A reminder that, when we are at peace, we are ready, willing, and able to meet whatever challenges life tosses our way with finesse and grace. And a flick of the tail. Beautiful, Nancy, made me chuckle! And I see TIgger is partial to him as well…hope he is settling down to his new routine. What a lovely daughter you have in Maddie, you will treasure that hare and those memories forever. I will, Rosemary. the cathedral and the hare- and the sighting of the three hares at Cotehele just days later – will always be inextricably linked. A clever and bright daughter with excellent taste – you’ve done a good job, Kate. Maddie is such a sweet young lady, and such an apt choice she made. It was lovely, wasn’t it? A creature of fairy tales. Just my sort of thing. They are. I’d love to be able to watch them i the wild more. Have a look at the link, Debra: there is a map showing the sightings of the three hares symbol. It appears a huge amount in churches here and old buildings. An absorbing subject! Interesting story on hares…had no idea!! BTW the letting go is a long process. Techie is 18 and off to Uni this Autumn….. crikey. I haven’t got anything clever to add, but I do want to say this touched me on a number of levels. Thank you. I loved your story about the hare. But I love even more your descriptions of your daughter, Maddie, and her thoughtful gift. That hare is one I know you will treasure forever. Years ago, our daughter and her husband gave us a gift of a print – a small cafe table with chairs in an English garden. Every time I look at it, I am reminded of our last night in London with them when they made us tea and we sat in a beautiful English garden. Beautiful memories. He is magnificent 🙂 and given with such love! Extra post: in which the dog has a haircut.